First Appearance: Motion Picture Funnies Weekly #1 (Apr. 1939): "Here is the Sub-Mariner!" 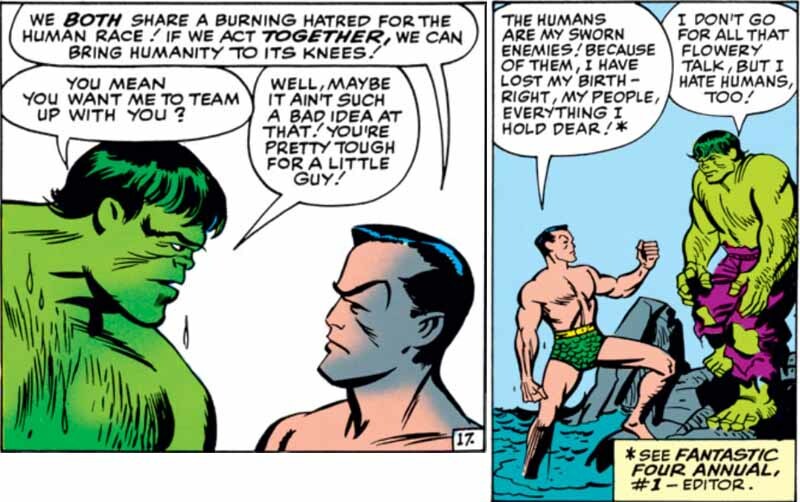 BELOW: The Hulk and Namor the Sub-Mariner join forces, united in their hatred for humanity: Upon meeting the Hulk for the first time, Prince Namor tells the green behemoth: "We BOTH share a burning hatred for the human race! If we act TOGETHER, we can bring humanity to its knees!" 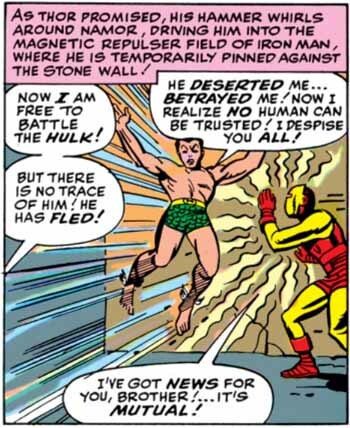 The Hulk concurs, saying, "I hate humans, too!" Their shared hatred for humans is somewhat ironic, given he fact that Namor is half-human and the Hulk's alter-ego is fully human. 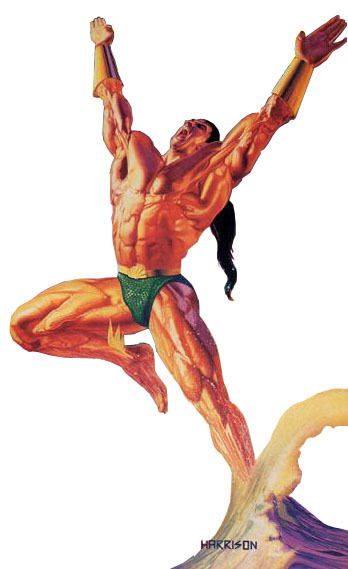 BELOW: Namor to the Avengers: "I pray we meet again! ": This may not be the most sincere ever prayer uttered. It's probably not really a "prayer" at all. 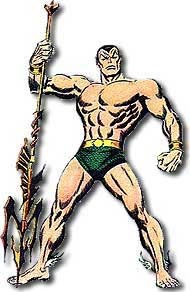 Namor is actually hoping for another chance to battle the Avengers and exact his revenge against humanity. 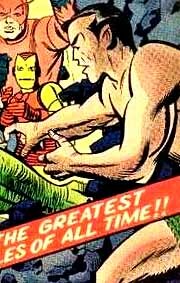 BELOW: After the Hulk (as Bruce Banner) flees the battle against the Avengers, his ally Sub-Mariner finds yet another reason to hate humanity: Namor exclaims: "He DESERTED me... BETRAYED me! Now I realize NO human can be trusted! I despise you ALL!" BELOW: The alliance between the Hulk and Sub-Mariner is a tenuous one: Although temporarily allied against the Avengers, they are both already thinking about betraying each other. Captain America (vol. 1) #181 (Jan. 1975): "The Mark of Madness!" Dark X-Men: The Beginning #1 (Sep. 2009): "Namor/Norman"
The Defenders (vol. 1) #2 (Oct. 1972): "The Secret of the Silver Surfer!" The Defenders (vol. 1) #4 (Feb. 1973): "The New Defender!" The Defenders (vol. 1) #5 (Apr. 1973): "World Without End?" The Defenders (vol. 1) #6 (June 1973): "The Dreams of Death!" The Defenders (vol. 1) #7 (Aug. 1973): "War Below the Waves!" The Defenders (vol. 1) #8 (Sep. 1973): "...If Atlantis Should Fall!" The Defenders (vol. 1) #8 (Sep. 1973): "The Avengers VS the Defenders Chapter 1: Deception!!" The Defenders (vol. 1) #14 (July 1974): "And Who Shall Inherit the Earth?" The Defenders (vol. 1) #82 (Apr. 1980): "Wizard-Death!" The Defenders (vol. 2) #12 (Feb. 2002): "Silent but Deadly"
Defenders (vol. 3) #1 (Sep. 2005): "Almost a Good Idea..."
Defenders (vol. 3) #2 (Oct. 2005): "Disaster!" Defenders (vol. 3) #3 (Nov. 2005): "The End of the World as We Know It!" Defenders (vol. 3) #4 (Dec. 2005): "It's Dormammu's World -- You're Just Living in It!" Defenders (vol. 3) #5 (Jan. 2006): "The Enemy of My Enemy isn't Exactly My Friend (But She'll do in a Pinch)!" Doctor Strange (vol. 2) #31 (Oct. 1978): "A Death for Immortality"
Fantastic Four (vol. 1) #412 (May 1996): "Settling the Score with the Sub-Mariner!" Giant-Size Defenders #1 (July 1974): "The Dynamic Defenders!" The Incredible Hulk Annual #18 (June 1992): "Four on the Floor"
Iron Man (vol. 1) #54 (Jan. 1973): "Sub-Mariner: Target For Death!" Iron Man Annual #10 (Aug. 1989): "Two If By Sea"
Marvel Feature (vol. 1) #1 (Dec. 1971): "The Day of the Defenders!" Marvel Feature (vol. 1) #2 (Mar. 1972): "Nightmare On Bald Mountain"
Marvel Feature (vol. 1) #3 (June 1972): "A Titan Lurks Among Us!" Marvel Mystery Comics #8 (June 1940): "The Search For Sub-Mariner"
Namor, the Sub-Mariner Annual #3 (July 1993): "...The Origin of Assassin"
New Thunderbolts #2 (Jan. 2005): "The Games People Play"
New Thunderbolts #3 (Feb. 2005): "Heavy Burdens"
New Thunderbolts #8 (July 2005): "A Shock to the System"
New Thunderbolts #9 (Aug. 2005): "Let Them All Die!" The Rampaging Hulk (vol. 1) #5 (Oct. 1977): "Lo, the Sub-Mariner Strikes!" The Rampaging Hulk (vol. 1) #6 (Dec. 1977): "...And All the Sea, with Monsters!" Super-Villain Team-Up #1 (Aug. 1975): "Slayers from the Sea!" Tales of Suspense (vol. 1) #80 (Aug. 1966): "When Fall the Mighty!" Thor (vol. 2) #4 (Oct. 1998): "From the Ashes"
Thunderbolts (vol. 1) #-1 (July 1997): "Distant Rumblings!" X-Factor Annual #4 (1989): "Saga of the Serpent Crown, Part 10: Emperor of Death!"